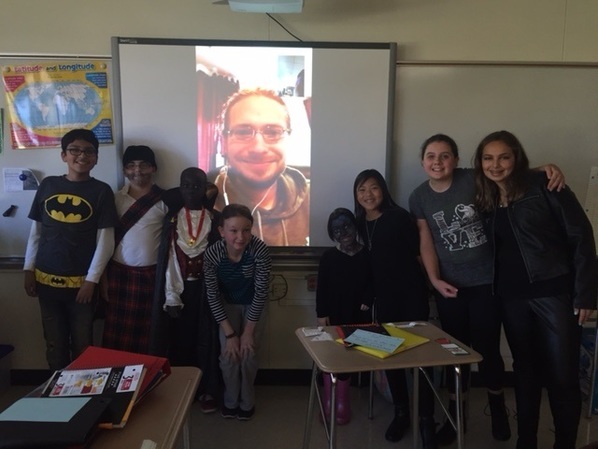 Author, Jeff Ritchie, generously gave advice to young writers at North Shore Middle School during a FaceTime call. He is the proud author of Fall From Grace. He helped these students in more ways than one. He said that gore is not what necessarily makes a story scary. He also said that it can be better to build up tension over long periods of time so you can chose when to scare the readers. This can really help in organizing stories, since it gives the author the extra flexibility. Mr. Ritchie talks about his process in writing books and advice on what to do when your work is not accepted into the publishing world. He said that even if it is not accepted, “it doesn’t mean it’s not good.” He also says that anything can be an inspiration. It can be a song, movie, TV show or even a book of a different genre. “It may be difficult to edit your story over and over but I know that my writing is getting that much better.” Ritchie said. So, persevere through your obstacles and don’t quit when it gets hard. Jeff Ritchie is an amazing author and was kind enough to take time to talk about writing with the children. He gave these students the confidence and inspiration saying, “Do it because you love it”.